What Are Horse Chestnuts And Ergots? 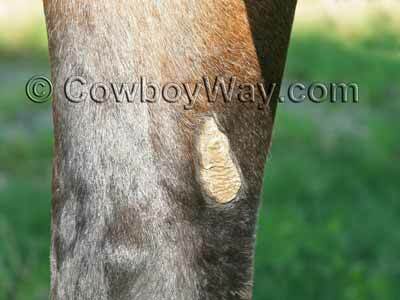 Horse chestnuts and ergots are normal, healthy growths found on most horse's legs. In the scientific community chestnuts and ergots are generally accepted to be the vestigial "toes" of Eohippus, an early ancestor of the modern horse that lived roughly 50 million years ago. By the way, "vestigial" means something that has lost most or all of its original function through evolution. 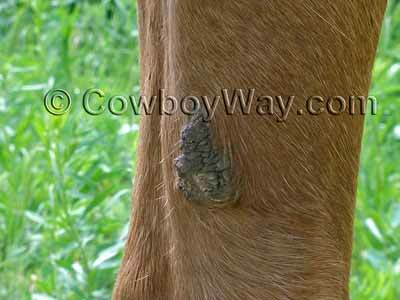 Chestnuts appear on the front legs of a horse above the knee, or on the back legs of a horse below the hock. They can be large or very small. Some people call horse chestnuts "night eyes." Ergots are found on the back of a horse's fetlock on all four legs, but they are usually covered with hair and can't be seen unless the hair is parted. A horse chestnut. This chestnut is about the size of a woman's thumb. Chestnuts can range from the size of a small fingernail to a couple of inches long or longer. This is a close-up of the same chestnut that is in photo 1. Chestnut patterns are unique to each horse. A different chestnut. This chestnut is not flat and fairly smooth like the one in the previous photos. A horse chestnut seen from the front. Chestnuts can be trimmed down to minimize their rough appearance. See the bottom of this page for more information. 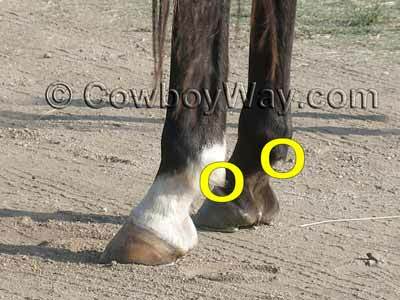 In the photo below the yellow circles indicate where ergots are on a horse's legs. Ergots can be found on both the front and back legs. 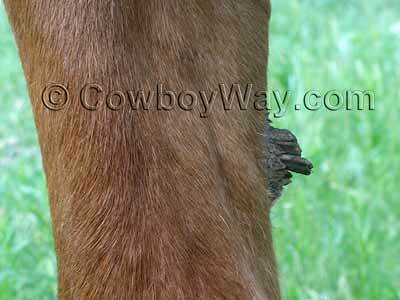 They are small growths on the back of the fetlock, and are usually covered by hair like on the horse in the photo. When you feel an ergot, they feel a lot like an eraser on the end of a wooden pencil. Both chestnuts and ergots can be trimmed without pain. While there's no real reason to trim them, some people choose to trim them as a part of a regular grooming routine. Do NOT try to remove either chestnuts or ergots entirely, and if you trim them don't go any deeper than skin level or above. Chestnuts can often be peeled off layer by layer with your hands or fingernails. If they are too hard, you can trim them, carefully, with a knife or other sharp tool. Ergots can often be pinched off with fingernails above the skin. Resist the temptation to twist the ergot as you pinch it, as this might be uncomfortable for the horse and you could get kicked or stomped. Ergots can also be clipped (hoof nippers are handy for this) or trimmed with a knife. Eo means "dawn" and hippus means "horse," so Eohippus is "dawn horse." 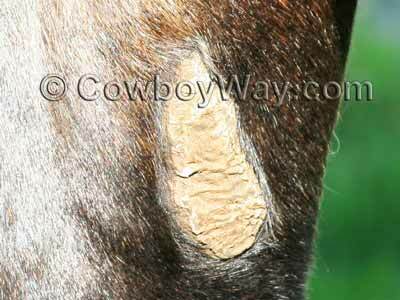 Do you groom your horse's chestnuts and/or ergots? If so, tell us how you do it in the comments below!